AAXA has announced the AAXA L1 Laser Pico Projector, an SVGA laser-based pico projector small enough to fit in the palm of a hand. 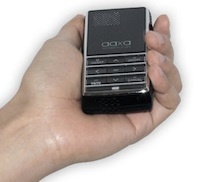 This pico projector incorporates the company's PCOS technology, which AAXA said combines a laser light source, proprietary despeckling technology, and an LCoS imager to achieve a 20-lumen output at 800 x 600 resolution. An unusual feature of the AAXA L1 Laser Pico Projector is that it incorporates an internal media player and data storage. AAXA said the projector also provides focus-free operation that allows for rapid changes in projection size, far and near surface projection, angled projection, and projection on curved and other non-flat surfaces. It runs on an onboard 1.5-hour battery. The AAXA L1 Laser Pico Projector is available for $599. Further information can be found here.